Hello! Today I have a five challenge card to share with you!! 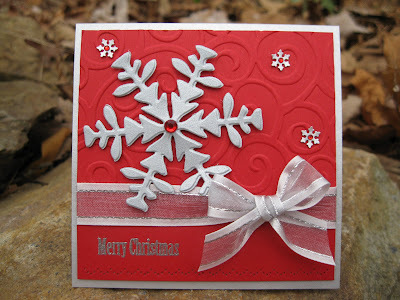 I used the sketch on Stamp TV and the recipe challenge on 365 cards. We were to make a 4x4 Card, have a Red Background and use Snowflakes (pattern, embellishments, any #, and any variety)and use 1 ribbon and a stamped sentiment. I used the color challenge on Design Dollies to use red and gray. It's also for the Crafty Creations challenge to use metal or metallic finishes. I think it's also fitting for the Creative Inspirations challenge which is Sparkle. My ribbon is sparkly along with the metallic CS and rhinestones! I like how this card turned out, I think the sentiment could be changed to make cute Thank-you cards for the holidays! Thanks for stopping by and be sure to let me know what you think. I love reading everyone's comments! very pretty card, Janice! it's a perfect red and grey combo! thank you so much for joining us at Design Dollies! So lovely! Wonderful snowflake! Thanks for playing the Crafty creations challenge!! This is wonderful. I love how great that CB EF looks with your snowflakes! Janice this is so pretty. Great job combining all those challenges - your card is beautiful!! I love your above card and am trying to find the dies/punches that you used. I have checked the Cuttlebug website, but the die that they are showing is not the same one and I am not sure how large it is. Can you please tell me how to find these dies/punches and how large the one that you have use is, so that if I have to substitue, I will know what size to look for. Thanks for your assistance and I love your website.